Yesterday on the flight from LAX to Midway I finished this book. I quite liked it. In fact I got into a very interesting discussion with my seatmates about it (one a grad student at UIC, the other a first grade teacher). The first grade teacher saw the cover and thought it was about picking a mate. She wanted to get it for a friend who “keeps picking the wrong girl.” The UIC grad student responded to the title by asking if I’d ever been to tedtalk.com. I replied that no I hadn’t been to tedtalk.com, and no it wasn’t about picking mates (although I suppose one could apply some of the ideas in the book to such an endeavor). It was about how we can become better choosers. Sheena Iyengar, a Columbia University professor who has made a career of studying choice, talks about how the brain has two different systems for processing information, one automatic and the other reflective. When the two align themselves, choice is easy. When they do not, dilemmas present themselves. 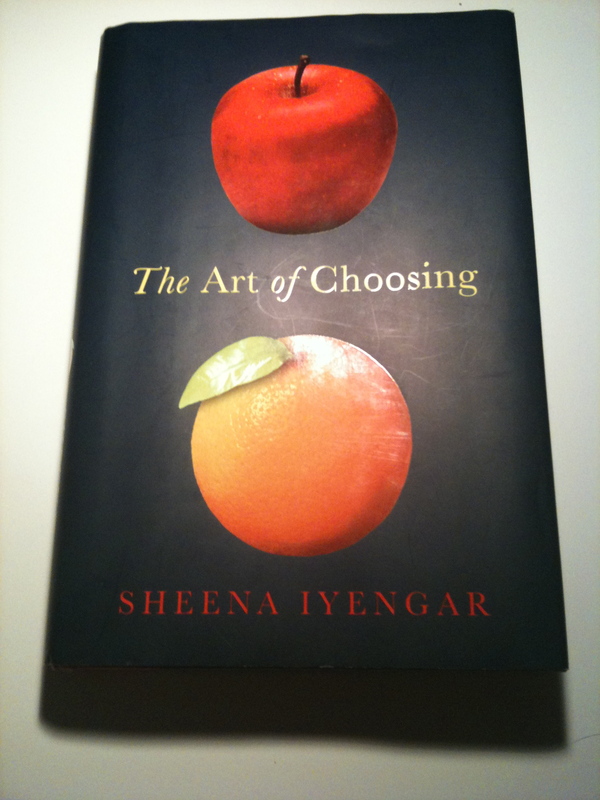 Through a variety of examples ranging from arranged marriage (individualistic versus collective societies and how choice works in these respective cultures) to fashion (how color trends emerge) to life-and-death medical decisions, she lays out research supporting a case for how we apply choice to create our lives. Along the way she references Marshmallow Studies, choosing between barely-distinguishable pink nail polishes, Pepsi v. Coke, priming, Odysseus and Sisyphus, “Cake, or Death?” and the role of cultural and media context in the exertion of choice. She posits that becoming better choosers requires the willingness to expand some of our areas of expertise, and to make ourselves uncomfortable. These observations resonate for artists, precisely because whether in set practices or improvisational activity, form and content rarely produce meaning without shape and boundaries to guide the endeavor. It is in the process of inquiry and choosing rather than from the final product or resulting choice, that we usually find our way. Gazing over dozens of goblets and cups of fine metal, stone, and wood –one of these objects was the Holy Grail — the ancient knight Templar in Indiana Jones and The Last Crusade warned Our Hero, “Choose wisely.” In reflective fashion, Jones did just that…and through his process, achieved the Grail. We hereby award pearls to Sheena Iyengar for her informative and provocative research, and the wonderful read from Los Angeles to Chicago.